Black Bros. manufactures a complete line of laminating presses for broad use in a wide range of industries. The presses are available in a variety of pressure ratings based on application. 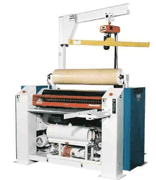 Dominantly laminating presses are used to bond panels made up of a substrate, covered by a face material. What is a Laminating Press? The job of a laminating press is to bond layered materials together to create a stronger material than the original. Typically this is done to achieve a cosmetic or performance aspect to the face for commercial or industrial use. Many laminating processes involve coating a film, textile, plastic, metal, wood, or other porous or non-porous substrate with a surface to strengthen it to be used for a much broader range of purposes. Often when we think of laminating, we think of teachers who laminate their cards and paper materials so they can withstand daily usage by children without being easily ripped or torn, but this is just the tip of the proverbial iceberg. While teaching materials may seem to be in the forefront of our minds when speaking of laminating, lamination is primarily a process used to create building materials for construction so they can handle a larger workload and/or not be easily damaged. From sky scraper construction to do-it-yourself projects around the home, lamination aids in the sturdy-nature that is necessary for the demands of everyday life! Laminating presses, and their processes, each have a unique set of parameters, typically revolving around temperature, pressure, time, humidity, moisture content, etc. Hot presses use heating platens, or rollers, heated with steam, oil, or electricity. Cold presses use ambient platens, or rollers, to generate force. The amount of temperature, pressure, time, and moisture content, all factor into how the process is determined. The end game of every laminating process is to achieve a rapid turnaround of laminated materials, and to move them into the flow of producing an end product. Virtually any component that goes into a wood or composite panel construction can be manufactured in a process utilizing a cold or hot platen style laminating press. And countless other applications where a feed-through roll process is desirable. At Black Bros., we offer a variety of machines and options to suit your specific operation. Let us be the source to find the best device to handle your lamination needs. Contact us and we will gladly work with you to specify a machine to suit your requirements.